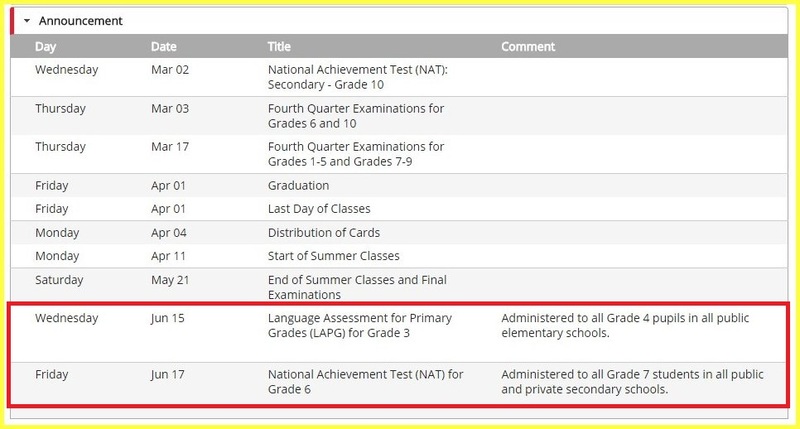 The conduct of the Language Assessment for Primary Grades (LAPG) and the National Achievement Test for Grade Six (NAT G6) this school year 2015 - 2016 is scheduled on March 8 and March 10 respectively, according to DepEd Memorandum No. 1, s. 2016. However, this had been superseded by a latest memo issued by Usec Dina S. Ocampo for their postponement. Ocampo relayed the clarification as to the reason why these testings would be conducted on the later dates. In an educative gathering of teachers in Cebu City, she announced that LAPG 3 and NAT G6 is postponed due to failure in the bidding process. 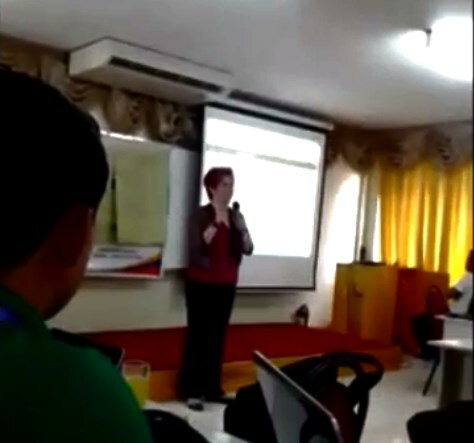 There is a video coverage to this effect posted in the social media by one of the teachers concerned. The Bureau of Educational Assessment (BEA) which is the former National Education Testing and Research Center (NETRC) shall the administer those testings. To correlate language development across Early Grades Reading Assessment (EGRA), Early Grades Mathematics Assessment (EGMA) and language literacy assessment in the primary grades. Under Secretary for curriculum, Dina S. Ocampo issued a memorandum to this effect for the postponement of LAPG 3 and NAT G6 to all Regional Directors, Schools Division Superintendents, Division Testing Coordinators, Public and Private Elementary and Secondary School Heads. The memorandum was dated February 1, 2016. Eventually, it was circulated and published in the Facebook before it was officially announced in the DepEd Website. June 15, 2016 - Language Assessment for Primary Grades (LAPG) for Grade 3. It is to be administered to all Grade 4 pupils in all public elementary schools. June 17, 2016 - National Achievement Test (NAT) for Grade 6. It is to be administered to all Grade 7 students in all public and private secondary schools. This has made clear and has resolved the doubt and apprehensions of those public school teachers concerned. Please refer to DepEd Memorandum No. 26, s. 2016 for official announcement. I remember taking NAT when I was in grade 6 but I can't remember if i took that Language Assessment for Primary Grades.. ito po ba yung pinapabasa sa tabi ng Principal?? This would really be a great way to assess the program. Good luck to those taking the exam. Me too remember taking NAT but it's my first time to hear LAPG. Iba na talaga ngayon. Well, i hope this will make our future generations more competitive.